"And we all, with unveiled face, beholding the glory of the Lord, are being transformed into the same image from one degree of glory to another. For this comes from the Lord who is the Spirit." 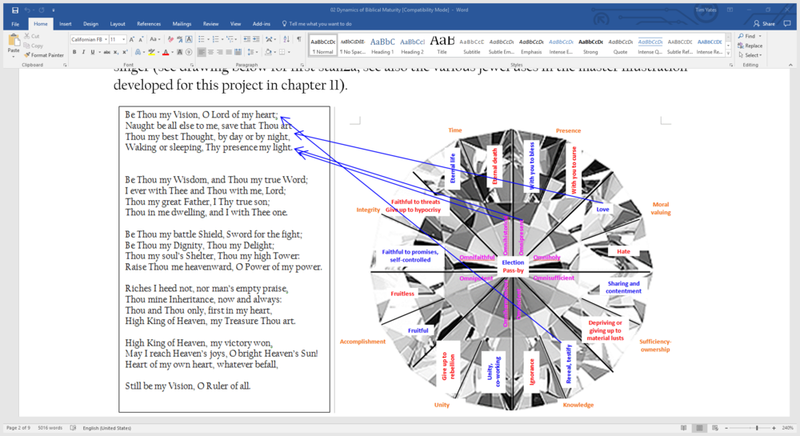 Using a theological foundation derived from the prepositions in Westminster Confession of Faith 2:2 that ‘God reveals his glory to, upon, in and by his creatures’ and by using a theological diagram (pictured above) and a summary catechism format (on the right) as teaching tools, readers can grasp the New Covenant relationship between eight omni-attributes of God and their derivative reflections in Christ’s humanity as the law-keeping Righteous One (WLC 99-150), and through saving faith (WCF 14:2) fulfilled in elect believers and their disciples who have the law written on their hearts. We are attempting something of a paradigm shift in theology, octo-perspectivalism with blessed and cursed faces linked to all Christian life themes. Unfortunately, standard Reformed understanding of some attributes of God as incommunicable has veiled their application to Christ likeness. This project unveils the usefulness of all God's attributes by proposing attribute-derived likenesses, removing the veil between the doctrine of God and all the other doctrines. Q3: Elect believer, what do you believe about the LORD’s glory revealed to you, that his derivative glory might be declared upon you, formed in you and reflected by you? A3: I believe the Triune LORD has revealed his glory through his persons and works to me by his Word and Spirit, from him as omnipresent, omniholy, omnisufficient, omniscient, omniharmonious, omnipotent, omnifaithful and omnihistorical, with both cursed and blessed faces, with derivative attributes of each of these omni-attributes perfectly fulfilled by Christ in the works of his human nature for me, the cursed face of God endured by Christ at the cross for me, so that his derivative glory might be declared on me (propitiation , justification), formed in me (repentance, vivification) and reflected by me (excommunication, representation) in realms (heavenly, earthly) and places (assembly, creation, diaspora) where I live. Advising Director of Family Counseling Center, Taipei, Taiwan. Church affiliation: ordained Teaching Elder in Presbyterian Church in America since 1991. Since completing studies (BA Counseling; BS Biblical Studies at Geneva College 1984, M.Div. 1989 and D.Min. Counseling 1997 at Westminster Theological Seminary) Rev. Dr. Yates has searched for a integrating perspective that will help to more effectively communicate Reformed theology. With over 25 articles in the Chinese Family Biblical Counseling Center Journal and the CRTS Bulletin and teaching 26 different regular semester classes in OT, NT, ST, BC/PT, the Be Thou My Vision Series is the fruit of years of biblical study and practical ministry, using eight omni-attributes of God as an integrating perspective on all other theological and practical topics. Readers' theological framework and practical ministry applications will be renewed. Happily married to Barbara for 32 years and parent of seven of their own children, (three are married) with four grandchildren, these family life experiences have deeply shaped Dr. Yates' passions for seeing and writing about connections between the glory of God's attributes and all aspects of Christian family life. Application books to be published based on the first published Foundations book will include topics related to parenting, marriage, and premarital counseling. Dr. Yates' own children will be involved in the process of developing these books. May the Lord turn his blessed face toward you!